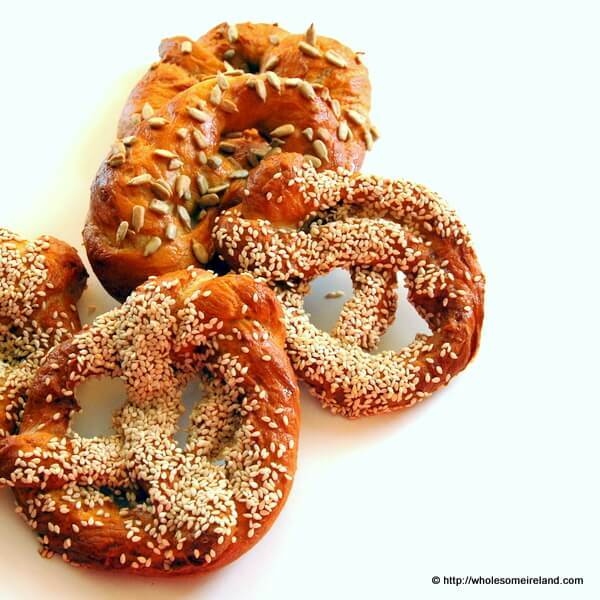 Published on 13 September 2012, Tom Kitchin’s book is published by Quadrille Press, this is my review and I tested one of his recipes from the book; pretzels. Visually Kitchin Suppers is a feast with tight, close up shots of beautifully plated food in earthy tones. The paper has a lovely texture to the touch which makes it easy to hold and leaf through. Language in the book can read like a bistro menu in places and some of the terminology is more commonly used in a chef’s kitchen, not in the home. For the experienced cook this wouldn’t be an obstacle but for the average home cook, terms such as “nage” could alienate them from certain recipes. The ingredients for a number of the dishes could be hard to source in Ireland unless you live in urban areas, for example; partridge, girolles and Jerusalem artichokes don’t tend to be available at your local supermarkets, to name but a few. I wanted to put his recipes to the test and in my experience the most experienced cook can go to a shambles in the kitchen when trying out a bread recipe. So I figured what better way than to make his pretzels? So on a damp morning 1st of October 2012 I set out to make 8 pretzels as detailed in the “Breads & Savoury Nibbles” section of the book. It has not been an easy one to try out I confess. Perhaps I over-reached myself by trying to prove the dough, shape the pretzels, poach and then bake them all in one morning. The end result has been some crisp pretzels that are light to chew on, flavoured with sunflower and sesame seeds. Would I make them again? Perhaps not. I’ve a tiny kitchen. Right after I’d made the dough I had huge doubts as to whether the recipe was going to work at all as the dough felt very loose, despite not being sticky. There was simply no space where I could roll a 50cm sausage to shape each pretzel which resulted in some deformed pretzel action. I’m a perfectionist and would rather they all looked the same, however they tasted fine! Maybe I should move to a house with a bigger kitchen because I love many of the recipes in this book. I’ve already bought the ingredients to make his take on a classic “Pot Au Feu”, I will try out the Beef & Guinness pie later on in the week and I love the idea of matching pork chops with cheddar. A number of the recipes included in the book involve some pricey cuts of meat or fish. If money were no object I’d probably cook from Kitchin Suppers more often. As it stands I’ll stick to the more value cuts and options. I’d recommend this book to the more experienced home cook. Published by Quadrille Books, the recommended retail price of Kitchin Suppers is €25.20 or STG£20. Pour the warm water into jug, sprinkle on the dried yeast , stir and set aside for 10 mins until the yeast is fully dissolved. Put the flour, salt and sugar into the bowl of an electric mixer fitted with a dough hook. Work in the butter, followed by the yeast liquid, Continue to work the dough until it is smooth and no longer sticky. Transfer to a lightly oiled bowl, cover the dough with lightly oiled cling film and leave to rise in a warm place for about 45 minutes to an hour until doubled in size. Lightly grease two large baking trays. Knock back the dough, knead lightly and divide into 8-10 equal pieces. Using as little flour as possible, roll the dough into long sausage shapes about 50cm long and 1.5cm thick. Form each sausage into a pretzel shape, folding one end over the other and sticking the ends down using a little egg wash. Place on the prepared baking tray and over with lightly oiled cling film. Leave the pretzels to prove for 35-40 minutes until slightly less than doubled in size. Heat the oven to 180 degrees Celcius/Gas 4. To poach the pretzels, pour the water into a large (non-aluminium) cooking pot, add the bicarbonate of soda and bring to the boil. you will need to poach the pretzels a few at a time. Carefully lower them, one by one, into the boiling water and poach for about 1 minute, until they float to the surface. Remove with a slotted spoon and drain briefly on kitchen paper before placing back on the baking sheets. Repeat with the rest of the pretzels. Brush teh pretzels with egg wash and sprinkle liberally with coarse salt and/or seeds. Bake for 10-12 minutes until deep brown and crisp on the outside. Transfer to a wire rack to cool. Serve while still warm. Recipe from Kitchin Suppers by Tom Kitchin, published by Quadrille Publishing.